The Meade Polaris 130 EQ Reflector Telescope is a complete package, and with this telescope, you can spend more time viewing the stars, and less time setting up your equipment! This device offers you the best quality optical performance, as well as stable and sturdy mount so that you don’t have to bother with image clarity or be distracted by the wobbles. You don’t need to be experienced to use this device, you can enjoy views of the stars as soon as you get it home. The huge130 mm aperture delivers bright and clear images for the best view of celestial objects. 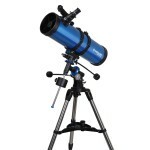 This telescope also features a larger than usual equatorial mount with graduated controls for added stability and to make it easy to track objects that you choose to focus on. 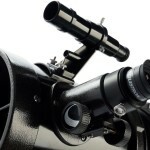 Just to ensure that you will be completely satisfied, the Meade Polaris telescope includes 3 eyepieces that provide a range of high power magnification for viewing a whole range of stars and other celestial objects. The eyepieces range from 6.3 mm to 6 mm to the magnificent 26 mm which provide the optimal viewing range depending on whether you want to focus on the Moon, the planets, or beyond and into the deep sky objects. 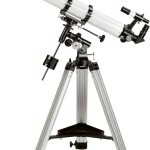 To enhance your knowledge of astronomy, and to assist you in how to get the most out of your purchase, Meade Instruments have also included a bonus Autostar Astronomy database DVD with several thousand celestial objects to choose from, when you purchase the Meade Polaris 130 Reflector Telescope. As can be expected with a quality product, this device comes with a One Year Warranty. 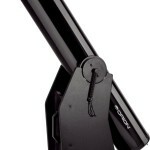 The Meade Instruments 216006 Polaris 130 EQ Reflector Telescope is a really neat package and a great looking telescope! Be sure to impress with this modern and smart looking instrument. 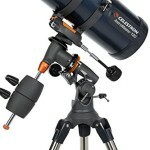 Neat and compact yet powerful enough to give you stunning views of the universe. In the case of the Meade Polaris 130, it is not the overall size that counts, but rather the aperture size. The wider the aperture, the more light that can be gathered by the lens, and the better the image can be focused inside the telescope. So you don’t need a telescope to be longer than everyone else’s, but rather better quality which leads to better images and increased satisfaction. “This is seriously a great telescope and I recommend it for any one, whether experienced or a newcomer to astronomy…” – follow this link to read the full reviews. 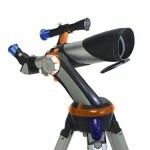 This telescope is very easy to use and easy to set up. That means we like to use it more frequently, and the kids just love it!